What happens to the submissions that are over 10 with the free account? I thought that the free submission was 100 replies. Now I know it's 10 but I already sent out my 100. What happens to the other 90 replies? I see that you already have reached the max limit for SSL submission (10). You can now only have 90 regular submission left within the month. 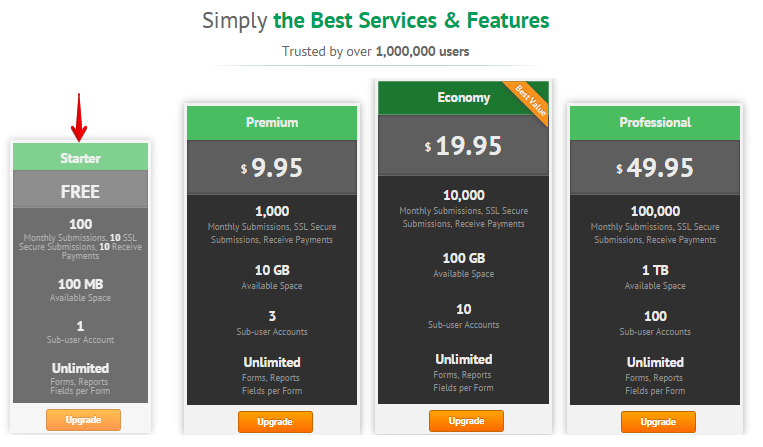 All the limits, except storage limits resets to zero(0) every 1st day of each month. If you exceeded any of the maximum limits allowed, the account will be in Overlimit Status, and it will not be able to accept any incoming new submissions. Forms will not be able to be submitted unless the overlimit status had been removed. If on overlimit status, you can either upgrade to the next higher plan to have expanded submission limits (this will take effect immediately). Or, wait for the next month, when all submission limits will be reset again. Hope this answers your inquiry. Let us know if there is more we can assist you with.